REGINA — Eric Norwood was not long for the free agent market, as the veteran defensive end has officially signed with the Saskatchewan Roughriders, the team confirmed Friday. 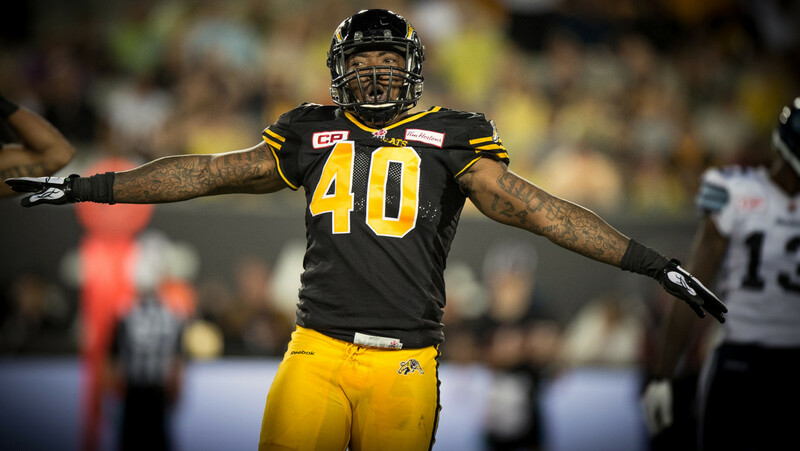 Norwood was released last week in somewhat of a surprise move by the Ticats, ending a three-year stint with Hamilton during which he emerged as one of the league’s premier pass rushers. Despite dealing with injuries over that time, Norwood recorded 24 sacks as a Ticat, including a career-high 13 in 2014. After being sidelined through part of 2015, Norwood returned for the Eastern Semi-Final against the Argos before suffering a torn ACL that kept him out of the team’s Eastern Final loss to Ottawa. No solid timetable has been released for his return, although it’s expected to be some time in the first half of the upcoming season. Norwood, a 6-foot-1, 241-pound Oakland, Calif. native, attended high school in Georgia before attending South Carolina. After being named a First-Team All-American in 2009 he was selected in the fourth round of the NFL Draft by the Carolina Panthers in 2010. Originally a Ticat in 2013, Norwood started in back to back Grey Cup losses to Saskatchewan and Calgary respectively. Last season he recorded seven sacks to go along with one interception while notably returning two fumble recoveries for touchdowns. The 27-year-old joins a brigade of new talent on the Riders’ D-line, including defensive ends Shawn Lemon and Justin Capicciotti.